The next step, after skin care, in a good makeover is to create an even toned canvas. This is done with foundational makeup. Moisture: foundations come in many types and weights. Choose one that works well with your skin type. If you have oily skin, you do not want a cream foundation that has a lot of moisturizing in it; if your skin is dry, you may want to avoid a powder foundation, unless it is over a liquid. Coverage: If you have fairly even and blemish free skin, you may find a light liquid, sheer tint, or powder foundation to be enough coverage. Undertone: knowing your seasonal pallet is a huge help here. If you have cool undertones in your skin, you will not be able to get a warm undertoned foundation to blend well (or visa versa) If you are unsure of which you are, choose a neutral based color. 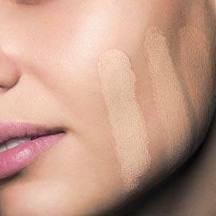 Depth of color: Your foundations should match your skin color. Pick a color that seems to match the back of your hand, test a small amount of the colors you are considering to your jaw line, the one that blends completely (disappears) is the correct color for you. Apply small amount to cheeks, forehead, chin; blend down and out. Blend into neck and decollate with makeup that remains on the sponge. Allow to dry before applying other products.